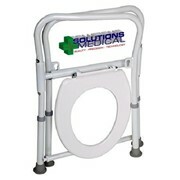 The fixed Hi-Loo is excellent for safe, secure transfers to and from the toilet. 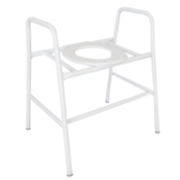 The ergonomically designed seat has a recess for intimate hygiene at both front and rear to provide the best access. 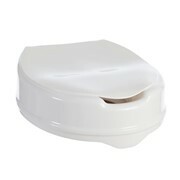 The Hi-Loo fits most toilets and remains securely in place. 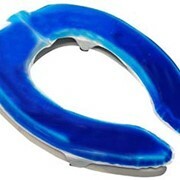 It has two large friction elements to provide a large contact area with the toilet itself. The friction elements can be replaced with adjustable brackets for users who transfer with difficulty. the seat can be snapped off for cleaning, which is made easy thanks to the smooth surface. 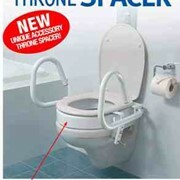 This is a smart variation on the Hi-Loo. Should there be a lack of space next to the toilet, one of the armrests can easily be removed, without the use of any tools. 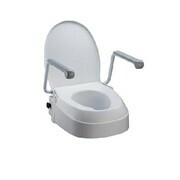 The Hi-Loo with armrests comes in two different heights; 6 and 10cm (2.25 and 4"). 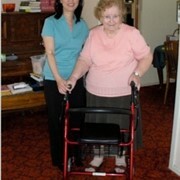 There is also an angled model which simplifies for users with impaired hip or knee mobility. The seat height is 10cm (4") at the rear and 6cm (2.25") in the front. It can easily be snapped off for cleaning. Also this model comes with flip up/removable armrests.